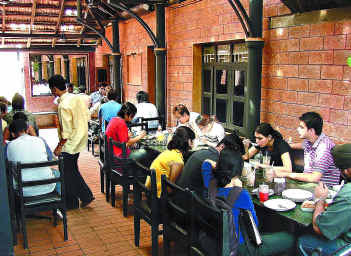 I’ve been dreaming about the food I ate in Manipal. Yes, it sounds strange considering I get to eat home food every day but somehow those memories are pretty tasty. Lets start off with breakfast; for a long time after I joined the Pharmacology Dept. my breakfast was — a samosa/egg puff or veg puff with loads of green chutney from “Akka’s shop”, talk about trans-fat filled mornings! The green chutney was heavenly, garlicky, tangy and just delicious!! I feel i ate all that fried stuff because of it. Then we discovered the Hospital Canteen–just opposite the fountain, near the Fresh and Honest coffee kiosk. So mornings were spent eating the yummy upma, sheera, watery bisibele bath, dahivada, puri subji and poha. Most of it cost less than 10rs a plate–and at the beginning of the month you would find us ordering more than one dish! For a short stint I also ate at the Food Court mess, the memorable breakfast there being bread toast served with alu tikki and butter, soft upma and puri and alusubji. Today I can’t even think of eating that kind of food, it’s idli or phulka most of the time–but i hardly thought about it then. Lunch and dinner depended on the cash flow, while i was in the mess, the food wasn’t that great. Sandhya akka’s parcels were good–when she realized that Ranju and I were southies, she supplied us amazing sambhars/rasams and traditional curries. I even liked her gobi manchurian and phulka combination. In the first half of the month Sudhi and I liked to visit Andhra mess, there the thali would include mounds of rice, hot pickle, an average curry and extremely spicy sambhar, rasam and pappu accompanied by a papad and to finish it off cold curd. We also made it a point to order something called alu fry, and would fight for the last piece. Then there was the north mess– a small smoky room where you got served hot phulkas straight off the stove and some yummy north indian curries– their chana masala was out of the world. Appu and I, in our restricted cash flow days went to Pangal, and had their limited thali, or visited Manipal mess and had hot tandoori rotis with half portions of gobi chilly and dal. I must also mention a favorite dollops meal—steamed rice-with salt and pepper–yumm! We would sometimes order parcels from the mess attached to Nehru, many a night before exams we’ve feasted on their kichidi and bhindi fry. And last but not least— snack time — I’ve eaten vada pav and mirchi bhajji from the corner shop near Anupam, feasted on potato lovers from snack shack, and had omelet and toast from BQ. The sandwiches from akka’s shop with their crisp cucumber tomato and green chutney fillings were also a favorite.